The first question that you should ask yourself is "What do I do when I think someone may need help?" The answer is simply ASK! Think of ASK like CPR. You don’t have to be a doctor to know CPR to save a life, you just have to keep the heart attack victim alive until the ambulance arrives. The same goes for ASK. Anyone with basic training can use it to save a life. STAY WITH: Never leave a person who is at risk of taking his or her own life alone. The only exception would be if you are in danger, if perhaps there is a loaded firearm present. Remember that your job is not to “heal” the person of these negative feelings. It’s to keep them safe until a trained professional, a social worker, doctor or psychiatrist perhaps, can intervene. Keep the person engaged with questions and comments that show you care and can empathize. Once you have confirmed that suicide is indeed a consideration, get more details. “Do you know how you’re going to do it? KONNECT: Wherever you are, there are resources available to help you. If the crisis is so imminent that you feel immediately threatened, such as the gun is loaded and at hand for instance, you can always call 911. The response may not be as sympathetic as you might wish, but if the threat is that immediate and law enforcement steps in, at least the person is still alive. The nearest Emergency Room is an alternative where you can find psychiatric help and counseling available. Many crisis response centers exist, where people who are trained to deal with your call, are ready and waiting to help. A complete list can be found on our "I Need Help / Who Can Help Me" tab, or by selecting the "Crisis Response Centers" yellow arrow above. Ask if there is anyone else to whom the person would feel comfortable talking to. A trusted member of your family, a grandparent, an aunt or uncle, a teacher, or even your pastor. 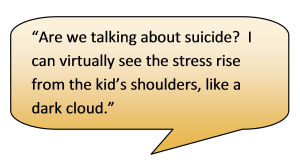 An interview with Karen Sundquist, a high school counselor, who discusses teen suicide risk factors and prevention on the Delmarva Peninsula.